Coral Medical Health Spa is very pleased to provide the Metagenics Ultrameal/UltraGlycemX weight loss and insulin resistance age prevention program, a comprehensive program that can help you address unwanted weight gain and sugar sensitivity. Insulin resistance or sugar sensitivity may lead to many unwanted symptoms including weight gain in the mid-section of the body, low energy, the inability to lose weight and more serious health issues like diabetes and heart disease. 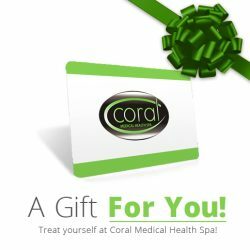 At Coral Medical Health Spa, our Lifestyle Educators will determined based on your health concerns the associated health issues including metabolic syndrome-such as excess body fat, high cholesterol, and other cardiovascular disease (CVD) issues-and/or type 2 diabetes, and will recommended the appropriate UltraMeal, UltraMeal Plus, or UltraGlycemX program combined with a dietary plan and a specific Patient Guide. You will meet with your lifestyle educator every two weeks for a follow-up bio-impedance analysis, girth measurements, and lifestyle journal modification if needed. In addition you will have access to your lifestyle educator six days per week via phone and email. Ultrameal 360 Meal Replacement Shake (1-3 serving or two ½ servings per day): UltraMealT Plus 360° V Low GI Metabolic Food with Plant Sterols, Hops and Acacia. UltraMeal Plus 360° is a delicious, nutritionally fortified powdered beverage product designed to support healthy body composition. A blend of soy protein, isoflavones, plant sterols, iso-alpha acids and acacia extract UltraMeal Plus 360° can also help support healthy cholesterol levels and insulin function. Contains reduced iso-alpha acids (RIAA) and acacia extract for selective kinase support. Ultrameal program implementation and coaching: By carefully studying the ultrameal journal and the bio-impedance analysis, the lifestyle educator will determine the appropriate caloric intake and food group split for each two week interval of the Ultrameal program. The bio-impedance analysis accurately determines the change in body composition relating to fat mass, muscle mass and water shifts in the body. Therefore, the lifestyle educator will ensure the correct balance of body mass reduction is accomplished throughout the program by maintaining and even increasing muscle mass while reducing body fat and managing water fluctuations in the body. What is Ultrameal/UltraGlycemX medical food? These products are a powdered beverage containing a combination of selected nutrients and phytonutrients that support important metabolic (biochemical) functions in your body. You can use these medical foods with the dietary plan that is provided with the patient guide you’ll be receiving when starting the program or with an alternative dietary plan individually tailored by Coral’s health professionals. In combination with the Ultrameal product the nurse practitioner might recommend additional supplementation as deemed necessary. A natural strategy should attempt to balance glucose and insulin levels. Simple dietary changes. Patients with blood sugar dysregulation that consume a diet high in simple sugars, processed foods, saturated fats, and low in fiber can exacerbate their condition. By eating the right kinds of foods, such as a low-glycemic-load diet, patients can enhance the success of their program. The glycemic index (GI) assesses blood glucose response to a food, and research documents that people at risk of diabetes should maintain a diet with low GI foods. Targeted nutritional support. Research suggests that certain vitamins, minerals, and phytonutrients in foods can improve the body’s sensitivity to insulin. That is, they can improve the cells response to insulin so that the body needs to secrete less of the hormone to achieve the same effect. And specific starches and fibers help stabilize blood glucose and insulin levels. Cinnamon. In a double-blind, controlled trial, cinnamon was shown to promote healthy insulin and glucose metabolism in people with diabetes. In vitro and animal studies also suggest that cinnamon may modulate insulin action. Specialized nutrients. Chromium, alpha-lipoic acid, vanadium, vitamin E, biotin, and magnesium support insulin receptor sensitivity and function, as well as insulin-stimulated glucose disposal. Antioxidants. Beta-carotene, zinc, selenium, copper, manganese, and vitamins A, C, and E help reduce the oxidative stress associated with hyperinsulinemia. Protein & isoflavones. Dietary protein adequacy and nitrogen balance are key in controlling dysinsulinemias, and isoflavone intake appears to be inversely associated with incidence of type 2 diabetes. Targeted carbohydrates. Studies have shown that high amylose starch improves insulin response and glucose levels of normal and diabetic subjects, and long-term consumption of a diet with high amylose starch may be of benefit in improving hypertriglyceridemia. Galactomannan from locust bean. Hypolipidemic agent that may substantially improve both the glycemic and insulinemic responses in patients with type 2 diabetes. Soluble fiber from guar gum. Helps lower postprandial blood glucose and insulin in type 2 diabetes. To view or print the Ultra Meal Weight-loss Program, please click here. For more information or to schedule a consultation with Coral’s Lifestyle Educators please contact guest services.